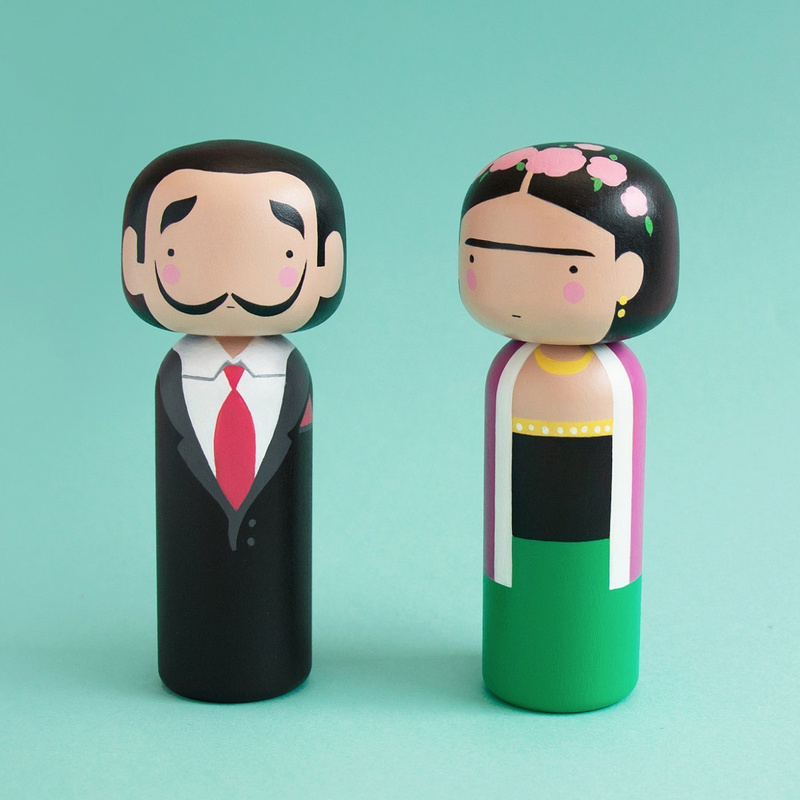 The Frida Kokeshi doll was inspired by the traditional Japanese dolls combined with the image of the fascinating Mexican painter, Frida Kahlo. From afar you see its shape: compact, small, delightful, but up close you notice the large head and cylindrical body. The Mexican painter on the other hand possesses a mysterious charm and fleeting air. Created down to the very last detail, with a portrait-like depiction and a cartoon effect, Frida Kahlo is easy to recognize. Her jet black hair with a crown of flowers, those unforgettable earrings, vibrantly-coloured dresses and bushy eyebrows: a symbol for beauty and a rebellious spirit, that thinks outside the box. 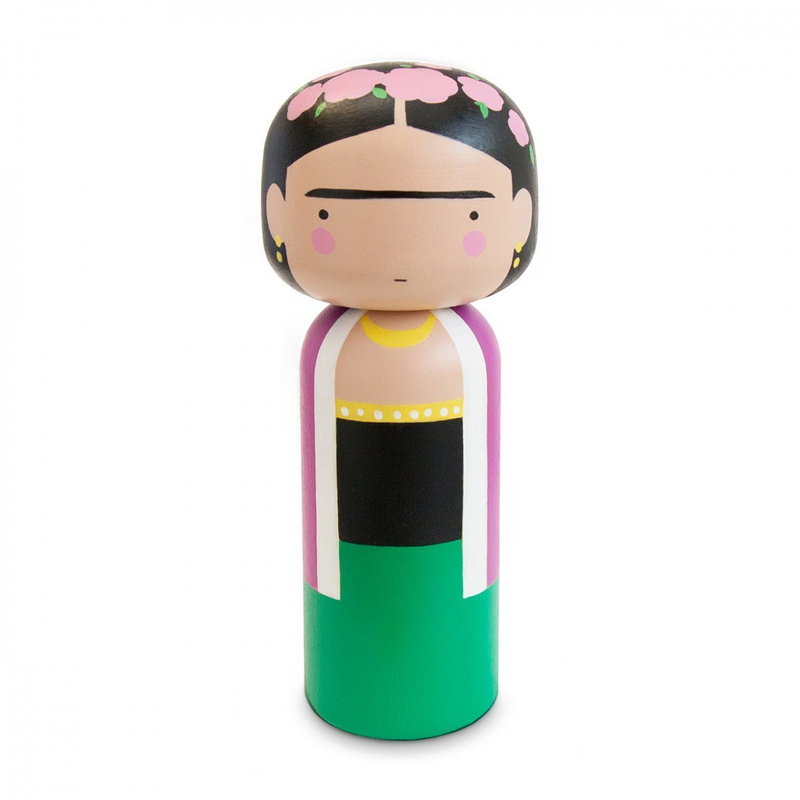 Rich in meaning, the Frida Kokeshi doll is a gift you'll want to keep to yourself or for loved ones. It's a designer piece, a collectable that meshes ironic and aesthetically pleasing elements with eastern, Mexican and even European influence. Behind the doll is Dutch brand Lucie Kaas, while the designer is up-and-coming Brit Becky Kemp. 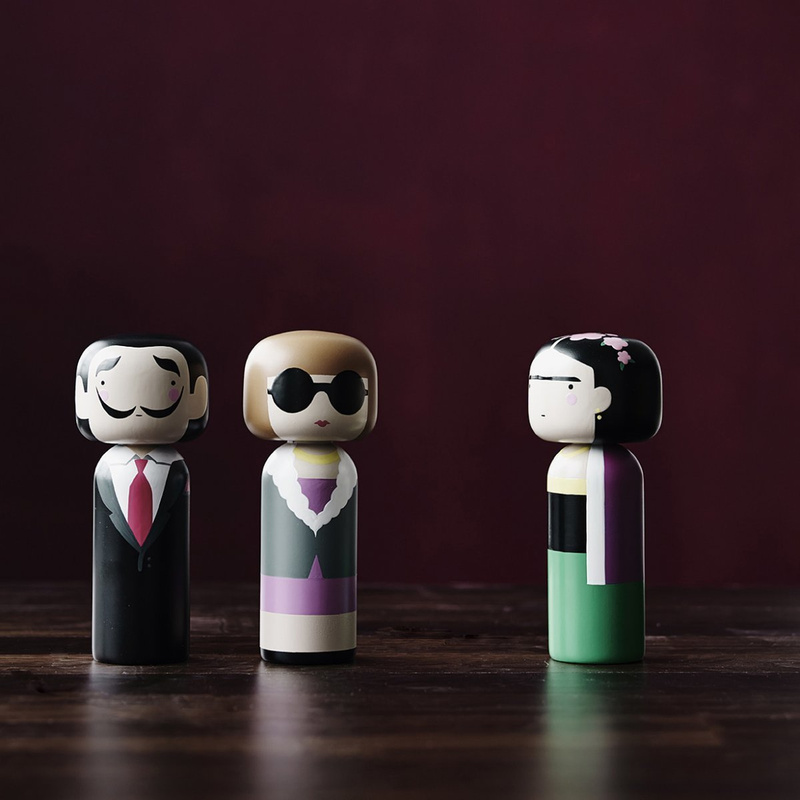 Created and painted all by hand, this Kokeshi is made completely of beech wood and finished off with a glossy varnish, which helps in protecting the colours and surface, as well as making for a particularly smooth doll that's pleasing to the touch. 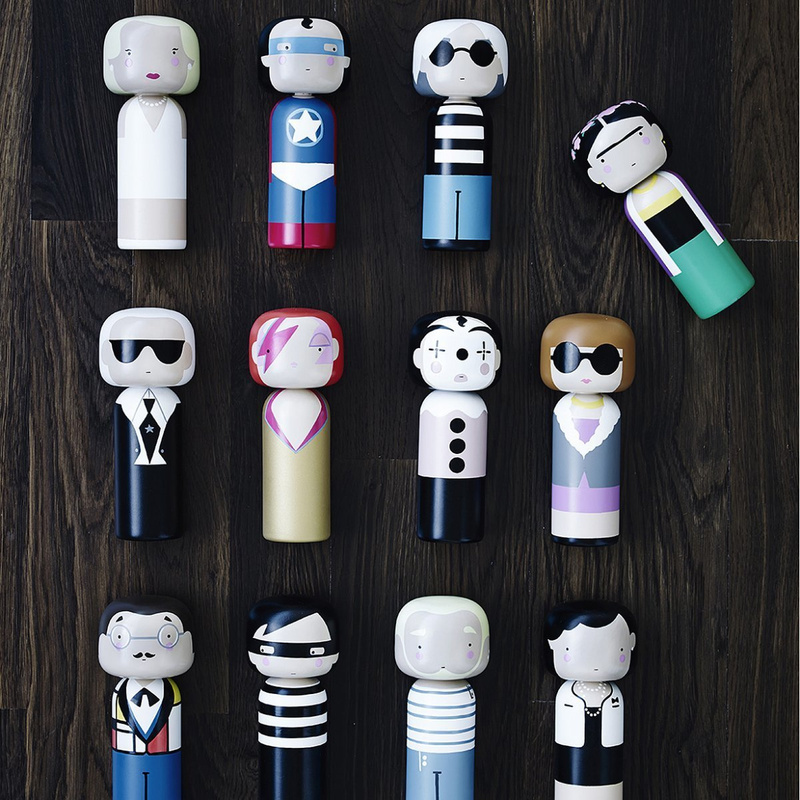 A small artisan piece that flaunts a contemporary design, the doll features a fascinating, glamorous and at the same time gentle design, no matter where it's placed. With its dimensions on the smaller side, it can enliven any layout, any table or any nightstand it may end up on. The piece offers a colourful object with a high-end style that grabs the eye right away, all the while adding a personal touch to both professional or domestic environments. Placed on a desk, as a paperweight or on a nightstand, it will offer up a ton of charm. Becky Kemp is an English artist based in South London. From a young age, Becky has been illustrating her daily impulses in a sketchbook. Born into a creative family, Becky always knew that she wanted to create and design. She studied Fine Art Paining for three years and also worked as an art teacher before deciding to concentrate full-time on her own work. 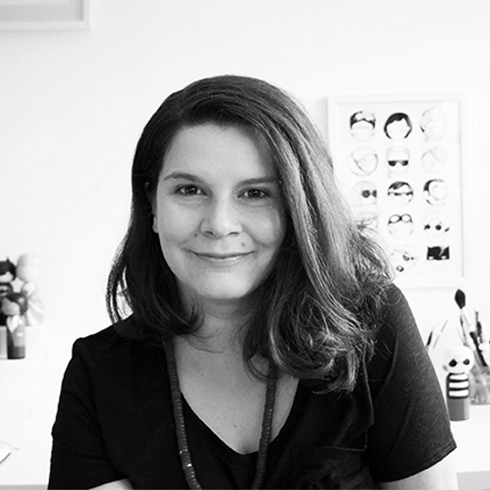 In 2011, she opened Sketch.inc – a creative studio from where she designed and sold all of her creations. Since then, her designs has gained huge popularity worldwide and are now represented in more than 30 different countries. Her work is inspired by a love for Nordic design and Japanese illustration. Becky has an uncanny talent for communicating with precision while still maintaining a humoristic and creative impression - a key combination that has lead to her success and cult following. Lucie Kaas was founded when the creative director Esben Gravlev discovered an iconic pattern and some old, wooden animals and decided to tell their stories to the rest of the world. The mission of Lucie Kaas is creating objects that tell a story.